I recently read Richard Wiseman’s Night School, a great account of sleep, dreaming and psychological research. On the subject of dreams, I’m none the wiser. Am I deleting unused or unnecessary information? Am I processing difficult thoughts and feelings? As I entering my subconscious? Am I entering some shamanic dream world denied to me during the waking hours? Am I seeing warnings of the future? At some time, nearly all of these have been true. I’ve had dreams of foreboding, and sometimes acted on them. I’ve had dreams prompted by anger, injustices, or trauma of the days and weeks beforehand. I often find I’m flying, and always have done since being a a child. I have dreamed lucidly, knowing it was a dream, and being able to choose which direction to take – not often, but sometimes. More and more, dead friends visit me in my dreams – one in particular. It’s never frightening, and sometimes I know that he’s a spectre, and sometimes it seems we’ve just met up again as we used to. Invariably, he has some sort of message or some discovery or revelation to bring. Mostly, I feel comforted that he has visited because I cannot reach him any other way. For a while, he is real to me. For a time, following surgery and medication, in the midst of anxiety or depression, I lost my dreams. These were the most unsettling times. I knew of their absence, and begged for their return, no matter how frightening or terrifying they might be, because the loss of them was worse than the truths they brough. They have always returned. There have been brief times when my dream world and my real world have interacted. Immediately after my heart surgery, my world was populated with Chinese nurses, vengeful caretakers, hippos created out of paper mache, and Arabian princes. I believed them all, and it took years for me to be dissuaded of their reality. I daydream easily and often, my mind wandering off into half created worlds and futures, passing minutes or even hours. On and off, I have kept dream diaries. I ask for dreams, and sometimes the requests are granted – answers to life decision, ideas for stories, characters, plots and projects. I can always remember at least some of my dream when I wake – although often feel frustrated that I haven’t recollected enough, or got to the end. But my dreams don’t have endings – mostly, the waking is its own end. I have often died in dreams, and dream in colour, destroying at least two popular myths. I don’t (largely) snore – so I am told, and have never talked or walked in my sleep, the thought of which disturbs me greatly. My dreams are entirely private, and acting them out in some way in public fills me with a self censorship my dreamland has always freed me from. I’m not a Jungian, or Freudian, and don’t really believe in dream symbols or interpretations. Occasionally , counselling clients discussed their dreams with me, and therapeutically I have found it most helpful to ask what emotion the dream brings up for them, as well as any special meaning they might attach to the dream. Invariably, we are able to find some understanding of the dream, although this is most probably simply interpretation rather than a ‘real meaning’. But dreams have never been unhelpful for me or for clients, and as a writer I am always surprised and welcoming f the worlds created by my dreams. I’d make a really rubbish vampire. Not because I’m particularly squeamish, or because I’m not actually hundreds of years old, living by night and afraid of crumbling to dust in the daytime. Or because I don’t have fangs. Just because I can’t quite get a hold on all that blood taking business. 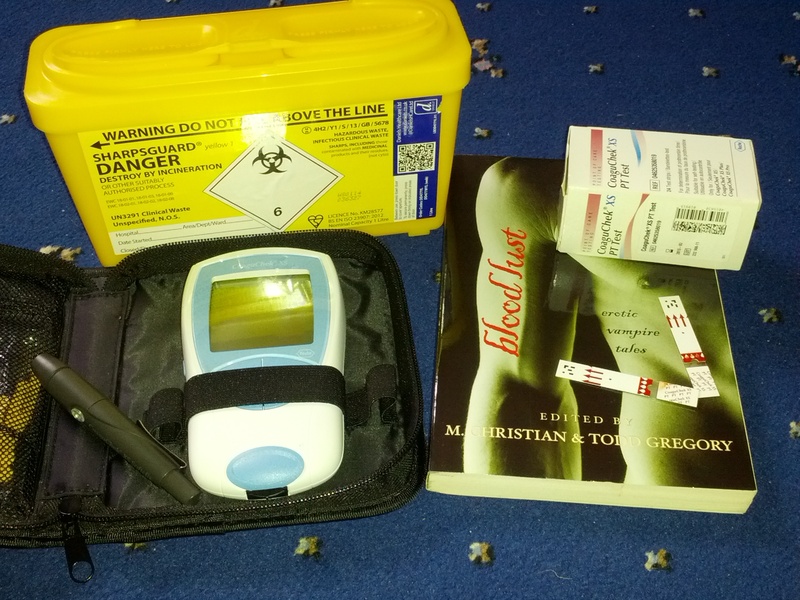 Some time ago, I blogged about warfarin home testing in It’s only a little prick, sir…! and the frustrations I was experiencing in getting my GP to accept NHS prescriptions for a home testing kit. The good news is that after contacting my Clinical Commissioning Group, I was able to clarify that test strips for the machine are available on NHS prescription, as long as I have completed a ‘training’ on use of the machine and able to provide the Doctor with evidence. The good news is that I’ve completed the training. It lasts all of 20 minutes and is actually me just doing the Haematology Nurse’s job for her – ie, taking my own blood through a fingerprick lancet device to test my INR to gauage how much warfarin I need. They train for years, of course, and I got 20 minutes. Which is how I know I’m not a natural vampire – I don’t have a knack for collecting blood. Since the training, I haven’t been able to get a single result at home, having now used up all the test strips I had. It seems simple enough, especially if you’re as butch as I am and don’t get squeamish about blood. You insert a lancet into the fingerprick device, prime it, stick a test strip into the meter, warm it, up and then dangle your arm to get blood flowing to the tips of your fingers. A gentle massage of your finger and then you have to whack in the lancet (without screaming) to prick the finger (quick, mind, as you only get 15 seconds before the blood starts clotting) and then you squeeeeze the blood onto the test strip for a count of two. If successful, the machine beeps loudly and hey-ho you get all sorts of wonderful magic test results. I haven’t managed this at all yet, and just spent an evening swearing and sticking plasters on finger after finger after finger until I ran out of test strips to play with. It looked like something out of Saw by the end of the evening. I ended up having to go to hospital to get properly trained nurses to draw blood out of me and do another test. Since then, I had a message from the GP about my ‘test strips’. I rang back, armed with all the info from I’d got from the CCG, anticipating a battle over the prescription again. They were just letting me know the prescription was ready – including a sharps box (I’ve always wanted a sharps box, it makes me feel like I’m in an episode of Casualty.) So, I’m going to have to try again. Unless you’re a vampire, or a murderer, or a trained nurse/heath professional, it is actually quite hard to draw your own blood without making a complete and utter hash of it so that you either fail to get anything at all, or you end up spewing out blood like some crimson geyser. When I had blood tests before my chemoptherapy treatment for testicular cancer, someone accompanying me fainted and had to be looked after by the nursing staff. Guys, aparently, are much more likely to faint around blood than women, which is why they make you sit dwn when they take any. I have never fainted, dear reader, for I am a man’s man. I need to hone my vampiric nature as I’m not giving up on the home-testing. I’ve booked a long weeekend in Transylvania in the hope that on a dark night, on a lonely country road leading to a moonlit gothic castle, some handsome Eastern European aristocrat might seduce me with his vampiric charm…. MWAHAHAHA. That’s your actual polari for hair cut. Or getting your knob shaved. It’s been a big thing. When I was planning for surgery, I was booking a haircut beforehand, just to feel a little better about myself in hospital. I might look pale, scarred and bloodied, with tubes and drips and canulas, but at least my hair would be FABULOUS. Hair. It’s such a strong part of identity. My neighbour was upset at losing his while undergoing chemotherapy. Understandably. And he’s not anywhere near as vain as me. I’ve been a skinhead, been bright red, bright blond, highlighted, lowlighted, had an 80s mullet, short back and sides, tied my hair with a band at the top so I looked like I had a fountain on my head. I’m even going grey. I mean, becoming a silver fox. I’ve used clippers on my own hair, had stylists and an old fashioned barber with a cut throat razor. Some styles have looked great, some I now admit look awful. Yesterday, I visited the Intensive Care Unit I was in 3 weeks ago. I was delivering chocolates as a thank you to the doctors and nurses (you have to give two lots – one for night staff, one for day staff – otherwise there’s war.) We joked about me obsessing about my hair while I was drugged up and vomiting before my operation. I’m feeling a little something like my old self. My second night where, although exhausted, sleep hasn’t come easy. One of the things about being ripped open like Christmas is having to sleep on your back as the scar and chest heal. It’s not my usual style, so I have a mound of pillows for support to keep me upright, like the princess with the pea. I’m wearing my invisible tiara. I’m cutting down on painkillers and that rat poison warfarin keeps changing, so the drugs may be having an impact too. Some of the meds are supposed to give me vivid dreams … If only! It’s all been a bit of a dream, full of Chinese paintings and alligators and floods and curtains getting changed at midnight in the hospital. I’m trying to catch up with 9 months backlog of Doctor Who Monthly, started reading books again but hiding from daytime TV. And people are being kind. Cards, good wishes, hampers, DVDs, a family offering 24/7 support. Return to living on my own in the flat where I collapsed is a daunting prospect, as is yet more surgery. This time last year I was just coming to terms with cancer and losing my least favourite testicle.